The Model STED Converter accepts a mV DC, thermo-couple, RTD or potentiometer signal, converts and normalizes it, provides isolation, and outputs 1 to 5 V DC and 4 to 20 mA DC signals. Two types are prepared for the STED converter: fixed input type that is fixed to mV DC, thermocouple, RTD or potentiometer, and universal input type that can select input type from mV DC, thermocouple or RTD. Burnout function is provided as standard for each type. 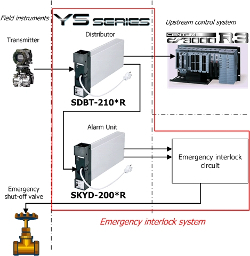 The Model SKYD Alarm Unit accepts input signals, and provides absolute or deviation alarm outputs. Absolute alarms are output after comparison of input signals from a single source with one or two setpoints, and deviation alarms are output after comparison of input signals from two sources with two setpoints. Direct or reverse alarm action can be selected for each of the alarm output settings. The front panel is provided with an alarm LED for confirming alarm relay operation (when relay is energized). The JHT200 Handy Terminal* is used for setting Alarm Unit parameters. On the SKYD model with display setter (SKYD- 04), input indication (engineering unit) and alarm settings can be set on the front panel. * The adapter for modular jack (E9786WH) is required for connecting the JHT200 Handy Terminal to the Alarm Unit. The SALD mV and Temperature Alarm Unit accepts a mV DC, thermocouple or RTD input signal, compares the input signal with an alarm setpoint, and outputs an alarm signal. One or two absolute alarm outputs can be provided on one input. Direct/reverse action can also be set to each of the alarm setpoints. Alarm LED is provided on the front panel for confirming alarm relay action (when relay is energized). The JHT200 Handy Terminal* is used for setting the Alarm Unit parameters. For the SALD with display setter (SALD- 4), input indication and alarm setpoints can be set on the front panel. *The adapter for modular jack (E9786WH) is required for connecting the JHT200 Handy Terminal to the Alarm Unit. The SDAU Digital Alarm Unit accepts two input signals (freely selectable from 1 to 5 V, mV, thermocouple and RTD), and six alarm detecting results are freely connected to AND or to OR. Then they are output to alarm relays (two points for standard). 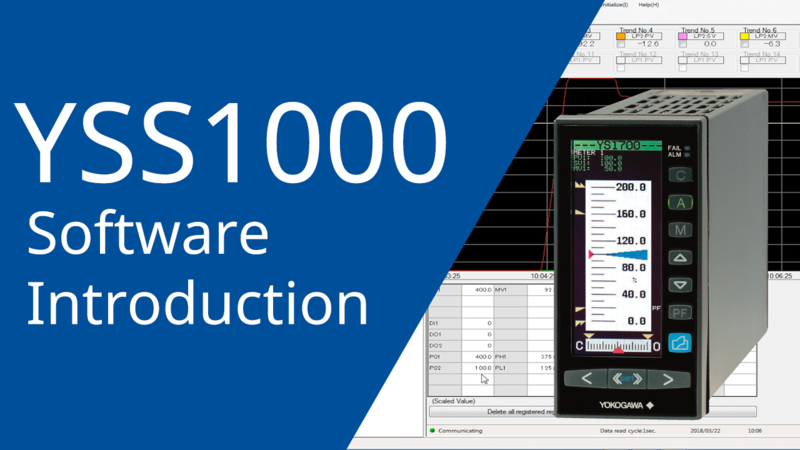 Each alarm detecting section detects upper and lower limits of absolute value, rate-of-change and deviation. Either a normally energized or de-energized is selectable for alarm output relays. Four points of alarm output, RS485 communication function or retransmission output can be optionally equipped. The display setter on the front panel can show input values and set/change parameters such as an alarm setpoint. The JHT200 Handy Terminal*1 can also set/change parameters. *1: The BT200 BRAIN Terminal can also be connected. The adapter for modular jack (E9786WH) is required for connecting the JHT200 or BT200 with SDAU. The SIND Integrator is a voltage-to-pulse converter that converts 1 to 5 V DC inputs to corresponding pulse frequency output. It can be used with a YS80 series SICD counter to totalize flow quantity. Two integrating modes are available: proportional integration that directly totalizes the input, and square root integration that totalizes square-root values. The JHT200 Handy Terminal*1 is used for setting Alarm Unit parameters. On the SIND model with display setter (SIND-x04), input indication (engineering unit) and alarm settings can be set on the front panel. *1: The adapter for modular jack (E9786WH) is required for connecting the JHT200 Handy Terminal to the Alarm Unit. The Model SISD Isolator accepts a 1 to 5 V DC input signal. The input signal is isolated from the power supply common and from the Isolator output signal. There are two outputs: 1 to 5 V and 4 to 20 mA DC. The Model SDBT Distributor supplies power to a two-wire transmitter and converts the 4 to 20 mA DC transmitter signal current to two 1 to 5 V DC and one 4 to 20 mA DC (for SDBT-21 type only) output signals. Isolation between input/output and distributor power supply is provided ("loop isolation"); isolation between input and output ("field isolation"); is specification. Current limiting (to protect against transmitter wiring short circuits) is provided, and a square root characteristic is optional. The Model SDBS Distributor supplies power to a two-wire transmitter and converts the 4 to 20 mA DC transmitter signal current to two 1 to 5 V DC output signals. Isolation between input/output and distributor power supply is provided. Current limiting (to protect against transmitter wiring short circuits) is also provided.